Continuation of a beautiful friendship in the 17th century on the Apennine Peninsula the Dalmatian county, the biggest part of the Croatian Adriatic Coast, was called Terra nauta - land of seaman. It is obvious that the skills and numerousness of Dalmatian seamen were appreciated in the homeland of Colombo and Vespucci. Maritime and shipbuilding tradition in Dalmatia have a long history. To those who build ships and those who sail - no country is too far. Seamen from Dalmatia have sailed not only in the Mediterranean, but in all world seas, where they acquired new knowledge. From one of those voyages someone arrived in Terra nauta on guc, a very old type of strong and endurable semi-displacement ship. Thanks to extremely good navigational characteristics, guc became popular in Dalmatia very quickly. Argument in favor of guc reliability and efficiency lies in the fact that her basic line remained unchanged for almost two thousand years up to now throughout Mediterranean Basin. Terra nauta 40 unites key elements of a long history of guc and meets modern nautical standards by combining safety with beauty, charm with strength of materials, challenge with reliability and simplicity with luxury.Terra nauta 40 – continuation of a beautiful friendship! There are rare ships where a helmsman can feel as captain that keeps in sight the sea, the sky and his vessel.Spacious cockpit of Terra Nauta 40 gives much more: continuous feeling of enjoying the navigation.High-tech navigational equipment, innovative system of hydraulic thrusters which enable easy berth of the boat during bad weather conditions and a possibility of wireless Internet support in case of any problem, are reassuring and guarantee a complete enjoying in the sailing to anyone. Enjoy the luxury, because you deserve it! 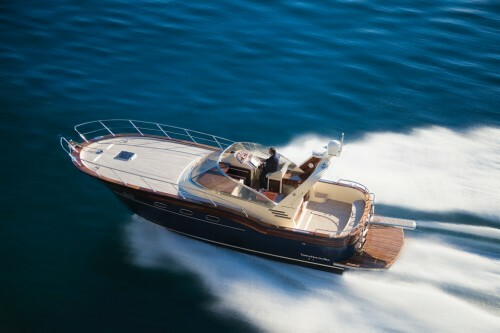 Three key words: RELIABILITY, COMFORT and BEAUTY describe this boat from its first draft to the final user’s opinion. Every detail on this boat is in absolute compliance with the key words nevertheless we speak about the best materials available on the market or space organization on the board and below deck. Deck is completely covered with first class teak, with flat bow surface of 13,5 square meters designed for sun tanning or dining. Stern is four meters wide, with benches coated with high quality water-resistant material is suitable for relaxed atmosphere for the crew and guests. A deck opening which enables a direct approach to the engine and other boat devices – portella – is provided with closure. But don’t bother with closure; it will be opened once a year for overhaul. Hull – of Terra Nauta 40 is made of fiber-glass and in its interior equipped with air conditioning hides all imaginable luxury of this boat. Three comfortable double bed cabins (two on stern and one in bow) have bulletproof glass just above water line in order to give a sense of being imbued with the sea.All boat furniture and partitions are made of padouk, the first class mahogany from equatorial Africa. Its exotic reddish-orange color is accentuated with six layers of varnish which allows slow, natural darkening of the wood. Flooring section is covered with merbau, while sitting part is made of soft, but resistant leather of color that perfectly blends with surrounding teak. 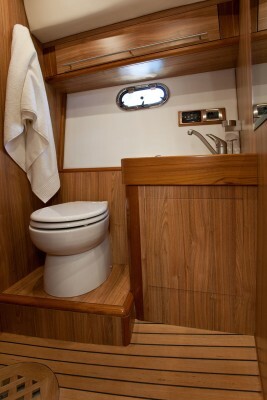 Ceramic tiles and sanitary ware in shower cabin are of the highest quality.Every centimeter and each corner of the Terra Nauta 40 is carefully designed for your needs: there is no item, part of nautical equipment or provisions that can not be safely stored.Traditional Mediterranean WORKING boat has been transformed into luxury yacht in unique, yet unseen way!